Are your orgainzation's public affairs professionals using up-to-date media campaigns? Are they using social media sites and the Internet to full advantage? Do you have a crisis communications plan in effect? 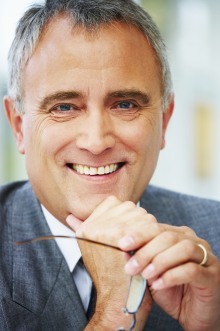 Are all of your personnel ready for media interviews? This Workshop is tailored for your organization's specific needs. During this two-day Workshop, all attendees participate in challenging group exercises and simulations. 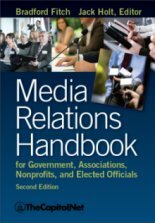 Our Advanced Media Relations Workshop is geared toward practicing public relations professionals with at least three years' experience. Take another look at what you're doing for your organization's communications strategies in a competitive environment. The Internet is the console to all communications in the digital age. Learn how public affairs professionals must adopt new ways of thinking, talking, and acting. Effective communication requires you to evaluate where your colleagues, clients, and competitors are on the Internet adoption curve, and to adjust your messages and methods of communication accordingly. During this session, find out where you stand as an Internet user. Attendees share communications strategies and efforts that have worked for their organizations. Different types of interviews and how to prepare your Principal for them (whether he/she is a "hog" or a "mouse"). Who should be on your crisis communications team and what procedures should be enacted? Don't hide behind "no comment"
This Workshop is also available as a custom, on-site training program anywhere in the United States. 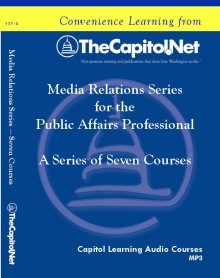 Suggested Prerequisites 3 years of experience or Media Relations for Public Affairs Professionals. A Certificate of Training is available for this Workshop. To get a Certificate of Training, your registration fee must be paid in full, and you must attend the entire course. This course can be approved for 1.2 CEUs from George Mason University. "This training has been incredibly helpful." "Terrific course. It exceeded my expectations." "It was an eye opener." "Very informative, interesting and helpful."